Posted 9:13 pm by terisman & filed under . Posted 8:55 pm by terisman & filed under . Read LWVK’s monthly newsletter VOTER Notes. Click here view details about Convention 2019 and to register online. Longtime political analyst Paul Johnson writes Policy Watch Weekly Update during the legislative session. Find it here! Along with LWVK testimony, Action Alerts, resources, and Legislative Observer Corps reports. Register to vote online at ksvotes.org or visit your county election office. Or call your election office to find out how to register by mail (they can provide a voter registration form to mail in). If you have moved or changed your name, remember to update your registration. Print the Federal Voter Registration Application and mail it in to your local election office. See more details on Registering to Vote and Voting in Kansas. Think you’re registered to vote? If you are registered to vote, you should receive a postcard before each election telling you your polling place and other valuable election information. The League is aware that some registered voters are not receiving their card. If you did not receive a postcard: IMMEDIATELY verify your registration at your local elections office or the Kansas Secretary of State’s Office. Use this form to report a problem. The League of Women Voters of Kansas is interested in knowing about problems experienced by Kansas citizens. We also are available to assist individuals currently facing an issue in registering to vote or in the voting process itself. LWV Leaders for Democracy Spring 2018 Webinar, featuring Marge Ahrens from LWVK, talking about the LWV Kansas/Fish v. Kobach case (scrub ahead to 29:50 to hear the Kansas story). The League calls on elected officials to do what’s right for the personal and economic health of Kansas. See more from our archive of media coverage. 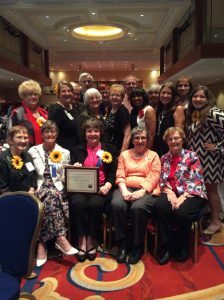 In 2016, the League of Women Voters of Kansas received the top national honor at the LWVUS convention! The Making Democracy Work(R) award is presented biennially to a state League for doing “the most to strengthen democracy” in its community.